user warning: Table './active5_foxes/cache_filter' is marked as crashed and should be repaired query: SELECT data, created, headers, expire, serialized FROM cache_filter WHERE cid = '2:5698e2eaee61f4aa63eafa4a2630ed88' in /home/active5/public_html/drupal6_multisite/includes/cache.inc on line 25.
user warning: Table './active5_foxes/cache_filter' is marked as crashed and should be repaired query: UPDATE cache_filter SET data = '<p class=\"rtecenter\"><img alt=\"\" src=\"http://www.catchingfoxes.com/sites/www.catchingfoxes.com/files/resize/blog/IMG_1984-486x358.jpg\" style=\"width: 486px; height: 358px; border-width: 5px; border-style: solid; margin: 10px;\" title=\"\" width=\"486\" height=\"358\" /></p>\n<p>If I were perfectly honest, and I am going to be for a minute, I miss being in graduate school. I miss everything about it from arriving on campus, grabbing the day&#39;s newspapers, and waving to my favorite barista at Einstein&#39;s in the Union to the slow walk back out to my van after class chatting with a professor or another student along the way. I miss the forty-five minute drive between campus and home and the feeling of going seventy miles per hour toward an unknown future. I miss the occasional wave from a student I shared a class with last semester. I miss that one undergrad who would yell, &quot;Hey MOM!&quot; very loud every time he saw me on campus. I miss the reading and the writing and the flash cards and putting my cold toes against Rich&#39;s legs when I crawled in bed at two in the morning after studying.</p>\n<p>One of my professors said her job was to take a room full of strangers and create a community in sixteen weeks. I miss that too. Graduate school was like a community book club for me. A very expensive book club, yes. But I approached the process as a whole and each class with the same enthusiasm that one would look forward to their weekly gathering with friends at the local Barnes and Noble cafe. Grades were not a big deal. The job I would someday get with the degree was not my motivator. 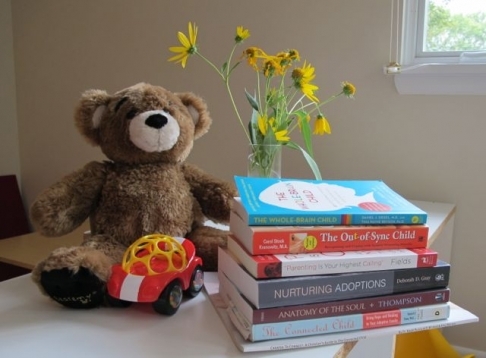 The process of talking, learning, sharing with others, and being connected by a topic of study and the books we read was the amazing part.</p>\n<p>I did not plan on discontinuing course work when we adopted Nathaniel. And I have flirted with the idea of taking classes every semester since he came home. But I knew a little bit about children referred to as &quot;children from hard places&quot; and that little bit of knowledge has stopped me from entering the classroom again.&nbsp; Karyn Purvis, author of <u>The Connected Child</u>, states that there are &quot;six primary risk factors that are predictors of children from hard places. These risk factors are: prenatal stress, difficult or traumatic labor or birth, medical trauma early in life, abuse, neglect, and trauma.&quot; I know enough about Nathaniel&#39;s birth mom to know he experienced prenatal stress. I know he was rushed from delivery room to operating room being resuscitated the entire way. A traumatic birth.&nbsp; And he still endures medical trauma monthly. Despite being placed directly from the hospital into a loving foster family and then coming home before a year old, Nathaniel has half the risk factors of being a child from a hard place.</p>\n<p>There has been significant study in the last ten years with children from hard places. Research finds common threads. They struggle with attachment problems, developmental delays, sensory processing disorders, and even experience structural brain changes. These truths pierce my heart every semester when I am tempted to sign up for a graduate class.&nbsp; More than therapies, excellent doctors, and qualified home health nurses, I believe my availability and love will go far in helping Nathaniel overcome the hard places he has endured and continues to endure. I can not be in a graduate classroom and the nursery at the same time.</p>\n<p>But God knows me. He wired me with a love of books and a passion for learning and a desire for community. And He settled me in a church that loves all of the above: children from hard places and learning and community and bringing healing through sacrificial love. In God&#39;s timing, as I am missing my old &quot;book club&quot; more than ever, our church is offering a fall adult Sunday School class for parents of children from hard places. We get to spend two hours a week together. We get to read books. (Look at the list below! Ten books total for the primary and secondary reading lists for a nine week class. That rivals some of my graduate classes! )&nbsp; We will hear teaching from trained instructors. We will watch videos from doctors and researchers. We will talk about what we are learning. We will share our lives. We become a better community for each other and for the children in our families who need strong parents with strong support networks. It does not surprise me that God is giving me a desire of my heart through this new &quot;book club&quot; opportunity, because I know it is part of God&#39;s nature to give good gifts to his children. But His good gift does delight me.</p>\n<p>Here is my fall reading list:</p>\n<p><a href=\"http://www.amazon.com/The-Connected-Child-healing-adoptive/dp/0071475001/ref=sr_1_1?ie=UTF8&amp;qid=1410548893&amp;sr=8-1&amp;keywords=Connected+Child\">The Connected Child</a> by Karyn Purvis</p>\n<p><a href=\"http://empoweredtoconnect.org/created-to-connect-study-guide/\">Created to Connect</a> by Karyn Purvis</p>\n<p><a href=\"http://www.amazon.com/Parenting-Your-Highest-Calling-Eight/dp/1400074207/ref=sr_1_1?s=books&amp;ie=UTF8&amp;qid=1410548994&amp;sr=1-1&amp;keywords=parenting+is+your+highest+calling+and+8+other+myths\">Parenting is Your Highest Calling and 8 Other Myths That Trap Us in Worry and Guilt</a> by Leslie Leyland Fields</p>\n<p><a href=\"http://www.amazon.com/The-Whole-Brain-Child-Revolutionary-Strategies/dp/0553386697/ref=sr_1_2?ie=UTF8&amp;qid=1410548893&amp;sr=8-2&amp;keywords=Connected+Child\">The Whole-Brain Child</a> by Daniel J. Siegel</p>\n<p><a href=\"http://www.amazon.com/Anatomy-Soul-Connections-Neuroscience-Relationships/dp/141433415X/ref=sr_1_2?s=books&amp;ie=UTF8&amp;qid=1410549018&amp;sr=1-2&amp;keywords=parenting+is+your+highest+calling+and+8+other+myths\">Anatomy of the Soul</a> by Curt Thompson</p>\n<p><a href=\"http://www.amazon.com/Out---Sync-Child-Carol-Kranowitz/dp/0399531653/ref=sr_1_1_ha?s=books&amp;ie=UTF8&amp;qid=1410549059&amp;sr=1-1&amp;keywords=the+out+of+sync+child\">The Out-of-Sync Child: Recognizing and Coping with Sensory Processing Disorder</a> by Carol Stock Kranowitz</p>\n<p><a href=\"http://www.amazon.com/Out---Sync-Child-Has-Revised/dp/0399532714/ref=sr_1_2?s=books&amp;ie=UTF8&amp;qid=1410549084&amp;sr=1-2\">The Out-of-Sync Child has Fun: Activities for Kids with Sensory Processing Disorder</a> by Carol Stock Kranowitz</p>\n<p><a href=\"http://www.amazon.com/Nurturing-Adoptions-Creating-Resilience-Neglect/dp/1849058911/ref=sr_1_1?s=books&amp;ie=UTF8&amp;qid=1410549117&amp;sr=1-1&amp;keywords=nurturing+adoptions\">Nurturing Adoptions </a>by Deborah D. Gray</p>\n<p><a href=\"http://www.amazon.com/Attaching-Adoption-Practical-Todays-Parents/dp/1849058903/ref=la_B001JS4R5G_1_1?s=books&amp;ie=UTF8&amp;qid=1410549140&amp;sr=1-1\">Attaching in Adoption</a> by Deborah D. Gray</p>\n<p><a href=\"http://www.amazon.com/Wounded-Children-Healing-Homes-Traumatized/dp/1615215689/ref=sr_1_1?s=books&amp;ie=UTF8&amp;qid=1410549172&amp;sr=1-1&amp;keywords=wounded+children+healing+homes\">Wounded Children, Healing Homes: How Traumatized Children Impact Adoptive and Foster Families </a>by Schooler, Smalley and Callahan</p>\n', created = 1555819984, expire = 1555906384, headers = '', serialized = 0 WHERE cid = '2:5698e2eaee61f4aa63eafa4a2630ed88' in /home/active5/public_html/drupal6_multisite/includes/cache.inc on line 108.
user warning: Table './active5_foxes/cache_filter' is marked as crashed and should be repaired query: UPDATE cache_filter SET data = '<p class=\"rtecenter\" style=\"\"><a href=\"http://www.facebook.com/CatchingFoxes\" target=\"_blank\"><img alt=\"\" src=\"/sites/www.catchingfoxes.com/files/resize/social/facebook-64x64.png\" style=\"text-align: center; width: 64px; height: 64px; \" width=\"64\" height=\"64\" /></a><a href=\"http://pinterest.com/kimmrankin/\" target=\"_blank\"><img alt=\"\" src=\"/sites/www.catchingfoxes.com/files/resize/social/big-p-button-64x64.png\" style=\"width: 64px; height: 64px; \" width=\"64\" height=\"64\" /></a><a href=\"mailto:kim@catchingfoxes.com\" target=\"_blank\"><img alt=\"\" src=\"/sites/www.catchingfoxes.com/files/resize/social/mail-64x64.png\" style=\"width: 64px; height: 64px; \" width=\"64\" height=\"64\" /></a><a href=\"http://www.catchingfoxes.com/rss.xml\" target=\"_blank\"><img alt=\"\" src=\"/sites/www.catchingfoxes.com/files/resize/social/rss-64x64.png\" style=\"width: 64px; height: 64px; \" width=\"64\" height=\"64\" /></a></p>\n', created = 1555819984, expire = 1555906384, headers = '', serialized = 0 WHERE cid = '2:48be9f28bc948ea32b70445d0a590c98' in /home/active5/public_html/drupal6_multisite/includes/cache.inc on line 108.
user warning: Table './active5_foxes/cache_filter' is marked as crashed and should be repaired query: UPDATE cache_filter SET data = '<div class=\"fb-like\" data-font=\"verdana\" data-href=\"http://www.facebook.com/CatchingFoxes\" data-send=\"false\" data-show-faces=\"true\" data-width=\"280\">\n	&nbsp;</div>\n', created = 1555819984, expire = 1555906384, headers = '', serialized = 0 WHERE cid = '2:854065b9b61ff8596c8fa62e384317c7' in /home/active5/public_html/drupal6_multisite/includes/cache.inc on line 108.
user warning: Table './active5_foxes/cache_filter' is marked as crashed and should be repaired query: UPDATE cache_filter SET data = '<p><strong>Catch for us the foxes, the little foxes that ruin the vineyards, our vineyards that are in bloom. </strong><br /><em>Song of Solomon 2:15 NIV</em></p>\n<p>Metaphorically, the &quot;foxes&quot; are the damaging attitudes and actions that can creep in and threaten the love relationship of a couple and a home. &nbsp;Catching Foxes is committed to being a resource as you guard against the things that might injure and destroy the harvest you are striving to grow in your home.</p>\n', created = 1555819984, expire = 1555906384, headers = '', serialized = 0 WHERE cid = '2:132a8457abcc78748ef29251eaa8f1d7' in /home/active5/public_html/drupal6_multisite/includes/cache.inc on line 108.
user warning: Table './active5_foxes/cache_filter' is marked as crashed and should be repaired query: UPDATE cache_filter SET data = '<p><a href=\"mailto:kim@catchingfoxes.com\">kim@catchingfoxes.com</a></p>\n', created = 1555819984, expire = 1555906384, headers = '', serialized = 0 WHERE cid = '2:fe7b2055d10a2c25c439ca4710d86502' in /home/active5/public_html/drupal6_multisite/includes/cache.inc on line 108. If I were perfectly honest, and I am going to be for a minute, I miss being in graduate school. I miss everything about it from arriving on campus, grabbing the day's newspapers, and waving to my favorite barista at Einstein's in the Union to the slow walk back out to my van after class chatting with a professor or another student along the way. I miss the forty-five minute drive between campus and home and the feeling of going seventy miles per hour toward an unknown future. I miss the occasional wave from a student I shared a class with last semester. I miss that one undergrad who would yell, "Hey MOM!" very loud every time he saw me on campus. I miss the reading and the writing and the flash cards and putting my cold toes against Rich's legs when I crawled in bed at two in the morning after studying. One of my professors said her job was to take a room full of strangers and create a community in sixteen weeks. I miss that too. Graduate school was like a community book club for me. A very expensive book club, yes. But I approached the process as a whole and each class with the same enthusiasm that one would look forward to their weekly gathering with friends at the local Barnes and Noble cafe. Grades were not a big deal. The job I would someday get with the degree was not my motivator. The process of talking, learning, sharing with others, and being connected by a topic of study and the books we read was the amazing part. I did not plan on discontinuing course work when we adopted Nathaniel. And I have flirted with the idea of taking classes every semester since he came home. But I knew a little bit about children referred to as "children from hard places" and that little bit of knowledge has stopped me from entering the classroom again. Karyn Purvis, author of The Connected Child, states that there are "six primary risk factors that are predictors of children from hard places. These risk factors are: prenatal stress, difficult or traumatic labor or birth, medical trauma early in life, abuse, neglect, and trauma." I know enough about Nathaniel's birth mom to know he experienced prenatal stress. I know he was rushed from delivery room to operating room being resuscitated the entire way. A traumatic birth. And he still endures medical trauma monthly. Despite being placed directly from the hospital into a loving foster family and then coming home before a year old, Nathaniel has half the risk factors of being a child from a hard place. There has been significant study in the last ten years with children from hard places. Research finds common threads. They struggle with attachment problems, developmental delays, sensory processing disorders, and even experience structural brain changes. These truths pierce my heart every semester when I am tempted to sign up for a graduate class. More than therapies, excellent doctors, and qualified home health nurses, I believe my availability and love will go far in helping Nathaniel overcome the hard places he has endured and continues to endure. I can not be in a graduate classroom and the nursery at the same time. But God knows me. He wired me with a love of books and a passion for learning and a desire for community. And He settled me in a church that loves all of the above: children from hard places and learning and community and bringing healing through sacrificial love. In God's timing, as I am missing my old "book club" more than ever, our church is offering a fall adult Sunday School class for parents of children from hard places. We get to spend two hours a week together. We get to read books. (Look at the list below! Ten books total for the primary and secondary reading lists for a nine week class. That rivals some of my graduate classes!) We will hear teaching from trained instructors. We will watch videos from doctors and researchers. We will talk about what we are learning. We will share our lives. We become a better community for each other and for the children in our families who need strong parents with strong support networks. It does not surprise me that God is giving me a desire of my heart through this new "book club" opportunity, because I know it is part of God's nature to give good gifts to his children. But His good gift does delight me.